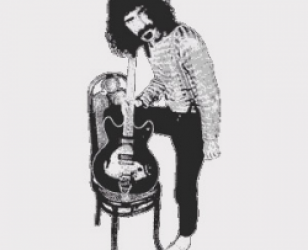 Short sleeved tee with impressive photo of Zappa as he stands with one leg on aseat and he holds guitar in an upright position next to his leg. He's barefootwith his trademark long hair and a moustache. Impressive t shirt photo print.